Here's a bit of Halloween ghoulishness for you! And exactly who do eye mean? 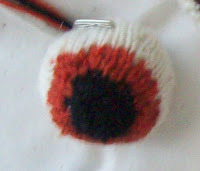 The Eye with the mote in it. Do you know the eyes favorite song? The Mexican Hat Dance! Everyone sing along: Eye; eye, eye, ya-eye, Eye, eye, eye-ya at ya! What do you say to eye ball soup? Or salad? Or maybe just keep an eye on (the collection.) 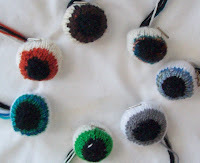 --or should I say a collection of eyes on hand? There is a deck of one-eyed Jacks, are storming the gates—hoping to pick up an eye, but it's an eye for eye here, they might take one of these, but I'll get an eye in return! For halloween! All the little candy corns have been sewn on! But you knew (perhaps) if you are on Ravelry. Well there is a scarf/shawl to finish.. and there is a shrug to finish, and .... (a rather long list of UFO's that should be finished or frogged!) 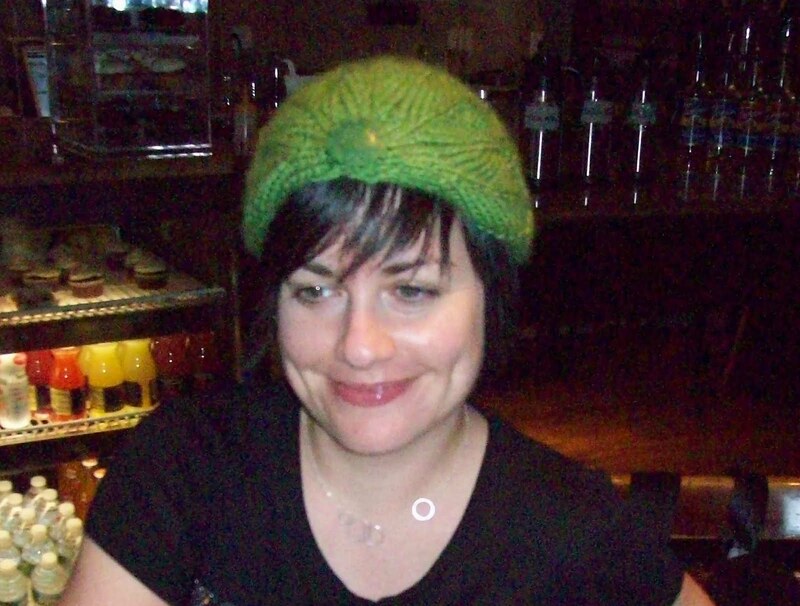 --Oh yeah there is a scarf (almost finished) to match the Leaf Me Alone hat (and that hat, is still not fully documented ). 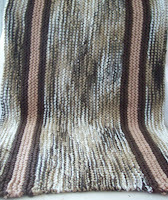 And I keep looking at lace scarf/shawls—I just got Knits from the North Sea-- there are so many shawls I want to knit! 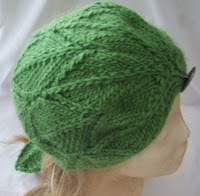 Also fermenting are other hat patterns-- Lots of them. 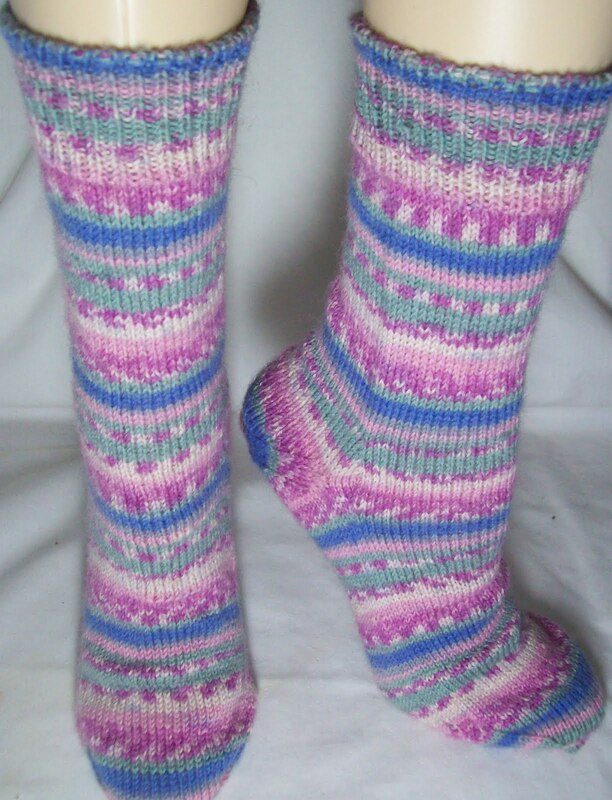 And sock patterns, too. The ideas for socks (most of which are for personal use and won't be documented patterns) come fast and furious. I write them down, and the list grows and grows. 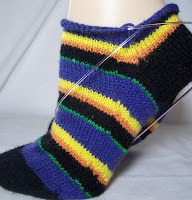 It grows many times faster than I can knit—and I have for the past few years been knitting socks at the rate of 1 pair a month –lunar month that is, (12 to 13 pairs a year!) Not always 1 per month--but sometimes a few pairs in one month, and a month or two with no socks at all, still, I usually manage to get at least 12 pairs knit per year. 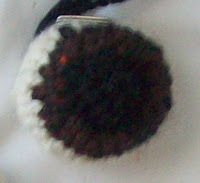 2--Top down puffy socks; red, then white, then 3 shades of grey, then a black foot. 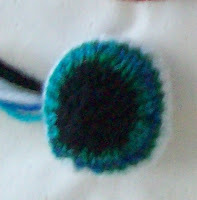 6—Swirl(Helix) sock –another way to use up some left over sock yarns. 10—Grey socks, with a raspberry swirl—I have a pair of grey/lemon swirl socks, and I really like them, even though the cast on is a bit tight-- I want another pair, done better. I am running out of space to store my socks (the sock drawer is full to overflowing!) but my desire to knit socks is unabated! And before I am half way through the list, I know I'll have a dozen more ideas! Same goes for hats.. 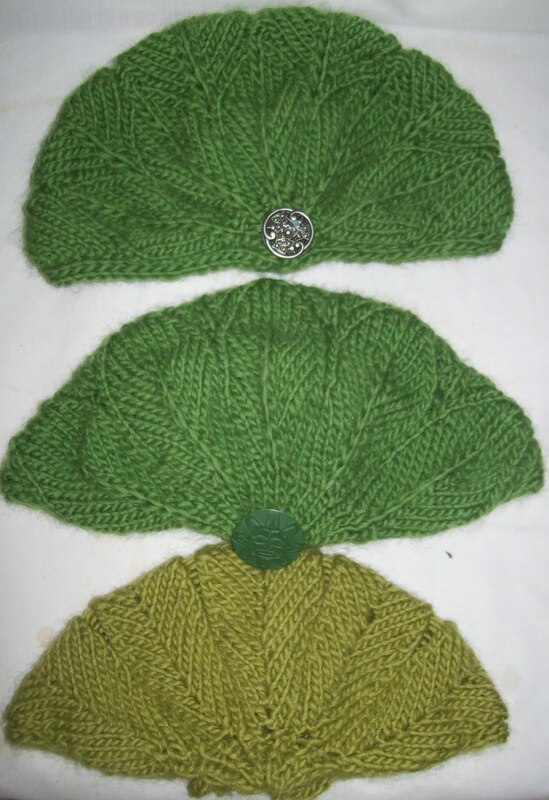 I have dozens of hats (and rarely wear a wool hat for warmth) but an unending desire to knit hats...Last year, I gave away to charity over 20 hand knit hats.. and still there are more hats ideas fermenting in my mind! I think I need to learn how to knit in my sleep. Here they are, 16 kernels of candy corn ! Gleaned from left over sock yarn (the Roy G Biv's in particular!) Ready to be sewn onto my striped socks. Well, sort of--(candy corn) -- High in fiber, artifical ingredients (polyfill and nylon re-enforcement in the sock yarn) and not very sweet—I think the best thing that can be said is: No high-fructose corn syrup! Well, maybe that is not the best thing! Today I'll get them sewn on the socks, and then the socks will be be ready for Sunday. I got distracted, and have some other ghoulish knitting too, but, that will be my halloween treat—you'll have to go on a hunt, or wait till then. Marta McCall (the first link (Marta) is to her web page, the second is to a Ravelry link) shared a link on FaceBook, and with out even following it, I copied the idea—good fun! Meanwhile over in Mochimochi land, Anna Hrachovec has this-- Wow. I am impressed. I wonder how many bags of candy corn they made! 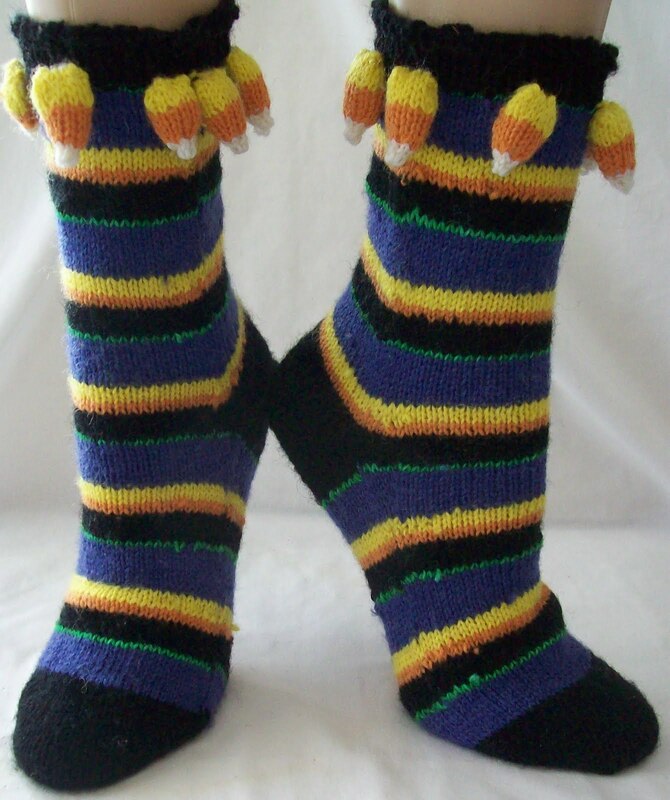 It's taken me as long to make the corn as it did to make the socks. I admit, I don't much enjoy making little things like this. I love my little candy corns, and I think they will make the stripe socks just right for halloween, but not fun knitting for me. Pattern purdah—for me--(it might be something different to Lisa) is hiding behind the computer, working out the details of documenting a pattern—so that it can be shared with others. It's done in secret, it's done in private, and it's a veiled process. New knitters often want to know how to design—and the answer is simple and complex. Just do it. There are short cuts-- But they are few and far between--computers are the best shortcut for documenting a pattern--cut and paste editing is so much faster than retyping each line, when all you need to do is change 1 or 2 numbers. I think (my opinion, but I am not alone) it is important to think out the overall design first. Well, um, if the hat has a crown, designing it part of designing a hat—and if you don't have a plan for shaping the crown, you haven't designed a hat, you've only done half the work. I swatch—but for me, even more important is thinking through each element. What direction am I going to knit? Top down? Bottom up? Side to side? Front to back? Flat and seamed? In the round, seamlessly? Left as a tube? Or steaked? What details are needed? What increases or decreases? Do I want to accent the shaping? Or hide it? How many to cast on? Partly a function of gauge/size, but also one of pattern repeats, and are there an even number of repeats, or an odd number, with a pattern repeat centered in front? I admit, I have my favorite cast ons, and favorite styles, and even favorite number's/gauge's—I love worsted hats with a cast on 96—what a magical number!--So many factors, 2, 4, 6, 8, 12, 16, 18, 24, 32,48—(I've forgotten some, but so what?!) It's so easy to plan things with all these choices, that will readily work! I also know, that for me, a driver to a new design is someone else's limits. Let some one say “there are 2 choices, for X, this way or that way” and Bam! I want to design something that is neither way! 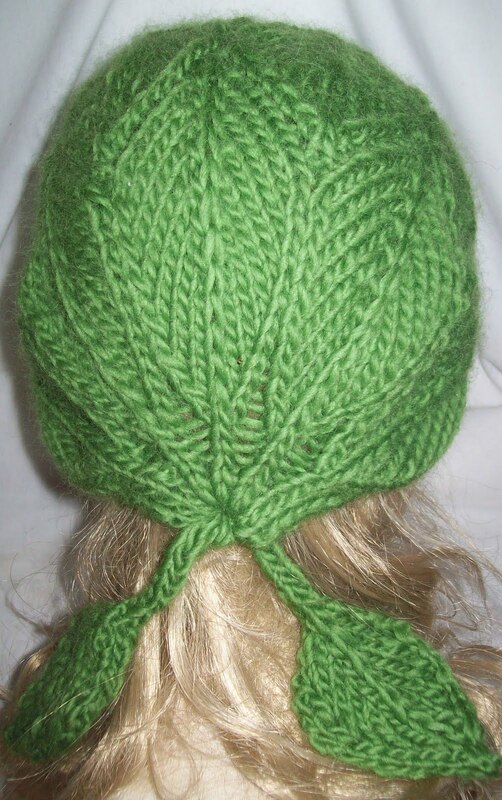 Tell me “all hats are knit either brim to crown or crown to brim” and I start knitting hats on the diagonal, or front (forehead) to back (nap of the neck) or some other direction (and there are more choices than the ones I listed!) –I am ornery that way! 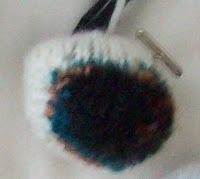 Tell me mittens can be seamlessly in the round, or flat and seamed, and I am off to the races.. knitting mittens (or gloves) in a simple double knit style—working, at once, flat, and at the same time, creating seamlessly tubes. For me, knitting is something physical—but its also a mental activity. I don't always sketch a design, and I sometimes don't swatch stitches, but I do, always mentally knit it out (or try to knit it out)a design in my head. Frequently, by the time I pick up needles and yarn, I've mental knit a design a half dozen times I've hit problems, and worked out solution (that fails) and work out new solutions (again and again) till I get a solution that works. And, of course, I still don't always get it right the first time. The stitch count might work out, the stitch pattern might work out, but the actually finished object –sometimes, one loved by others—is not what I had in mind. People only see the fingers working—and don't get, I can work from mind to fingers with out any paper trail only because I have put a lot of effort into planning (and mentally knitting) a project. By the time I get around to knitting it, it so easy to do the actually knitting, some think the whole process is effortless. It's not, it's just that I have failed to show my work! The hardest part of design for me, is documenting. I knit way more original designs than I document. Documenting means explaining to others all the details that have become self evident to me. And, not often talked about, but a definitely a real part of design-- are the duds. 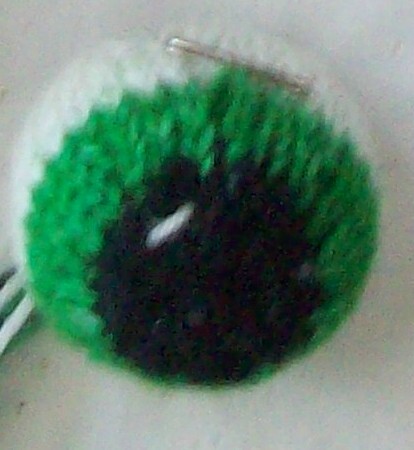 There isn't a designer I know who hasn't created an idea, worked out the design elements, and found, as they knit-DUD. Behind the veil of good design, in pattern purdah, a lot is going on. And what emerges is not always what is first thought of, or what was expected, but instead, something magical. The wizard had it right—pay no attention to what is happening behind the curtain—but the truth is, that is where all the magic, that isn't really magic at all, but just hard work and thought-- is happening. 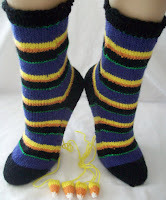 So the Halloween stripe socks are finished—all the end are woven in, and the are wearable. 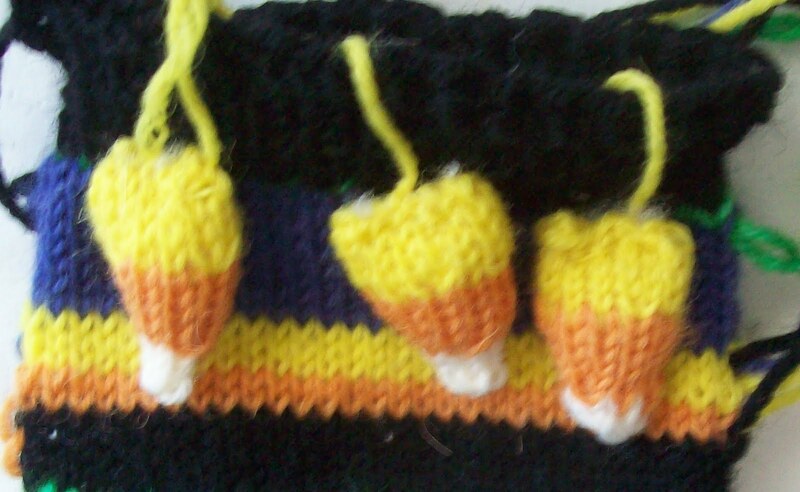 I even got a another candy corn knit—so now there are 4!--only 12 more to be knit, and then all of them to be sewn on. And I have started again with the Leaf Me Alone Hat--Version 3! Last night there were 8 of us--including Manny. And Manny got his first real lesson knitting. Manny—a former para-trooper—has been kibitzing with us for a few weeks, and SAYING: Gee that looks interesting, Gee, I wish I could do that. So last night, I brought along a partial ball of Wool (Paton's classic wool) and a pair of size 8's—and taught him the knit cast on, and had him knitting. He clearly like knitting, but is also clearly intimidated by the feminine and grand motherly rep of knitting. He's not sure if it goes with his masculine persona—but he has real courage—he is willing to try—and to step out of his comfort zone and knit, no matter what. Go Manny! On the other hand, he blushed more than once listening to the conversation—20 + years in the army didn't give him a lot of opportunities to be in women centered discussions. Nothing riské really, but a wide range of topics, (including breast feeding and the taste of human (vs cows) milk—though none of us are currently lactating). Mostly diet, and food tastes, and fashion --including childrens' and christening gown fashions—the old fashioned styles (long enough to be an adult womans dress) to some of the new glitzy ones. One comment that burned my ear was “Hoochy mom christening gowns—they looked like quinceaner dresses for whores..” (What an image!) --Several member of the group have --or about to serve as godmothers--and hand knit christening things have been projects for the past few weeks. This image is the back of her head, you can see her smiling face above. So this AM I started with the documenting (Typing Vs scribbled notes) –Version 3! More leaves, more selvage--but the same color (the Thyme green) –the left over from the skeins will definitely be made into a pair of matching leaf pattern fingerless gloves. Any day now, I will go back to making candy corn s and finishing them. Last year, Oops, make that 2 years ago (August '08!) 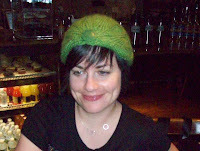 I knit this hat.. (my Leaf Me Alone hat) and I liked it, but it wasn't quite perfect. I have been thinking about improvements details of construction, in fit (and in color). 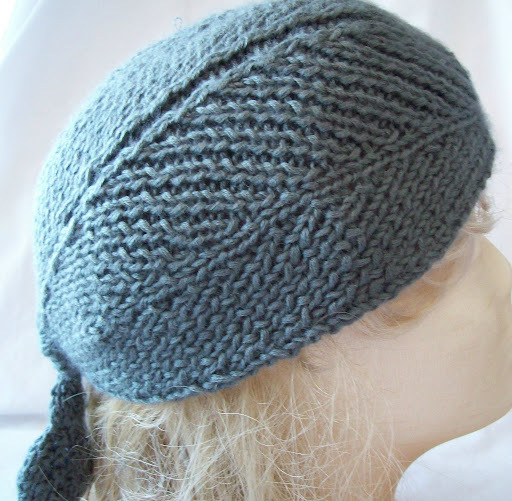 This first version(the grey) is an ALMOST hat. Some like it, (I like it!) but it wasn't exactly what I envisioned. And while it looks fine modeled on my styrofoam head, the head is 19 inches.. and my head is 23! (yes, I do have a large bowling ball for a head, now that you mention it!) So the hat didn't fit as I wanted. Then an idea presented it self...and Off I Went! Version 1—is better than the prototype..(well for one its green!) but it's too small (well its too small for my bowling ball (23 inch) head), and, well its not leaf-ee enough. (and yes, it too will be finished the back tie needs another leaf and both leaves will need linings)5 narrow leaves are less leaf looking than 3 broad ones.. I like the cast on/start, I like the tiers of leaves.. I like the fit. I might look even better with 3 tiers of leaves—and with the first rows (front ) leaves having even a bit more of a 'stem' to make them leafier--which will mean a re-write of the cast on/beginning! twisted single ply and doesn't like to be frogged) tomorrow. And them maybe a fourth in a different yarn of the same weight) and the directions finished (I've document to some degree all three prototypes) and a chart made, and a PDF! 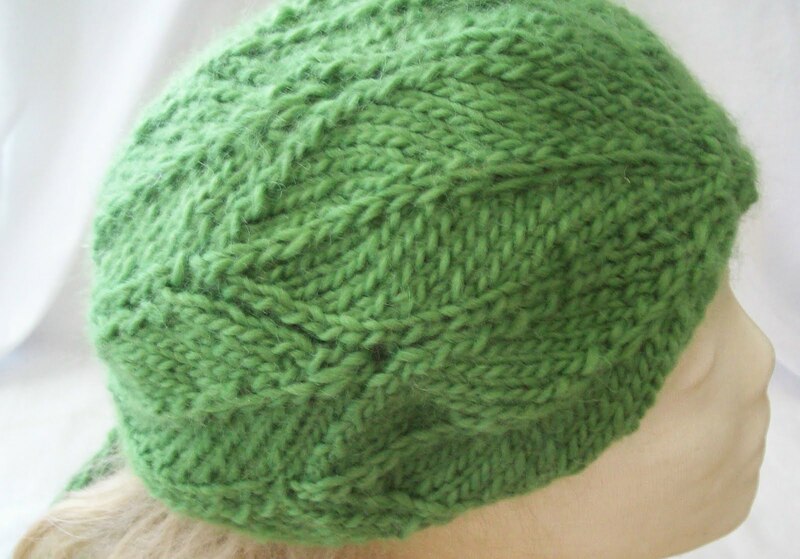 Thee is one major problem with knitting this hat-- Its given me ideas for another half dozen!--and for an idea of a matching pair of fingerless gloves to go with the hat! Wouldn't your hands look lovely wrapped in leaves? 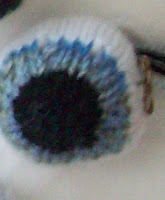 I've been writing ideas down (again) and my list of ideas grows so much faster than I can knit! 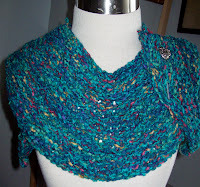 I work hard at thinking of ideas to use up the yarn I have--but it doesn't always work out that way. Even when it does, I have half a dozen knit sweaters, and in a really cold year, I might wear a sweater a dozen times so in the fall/winter/early spring season. 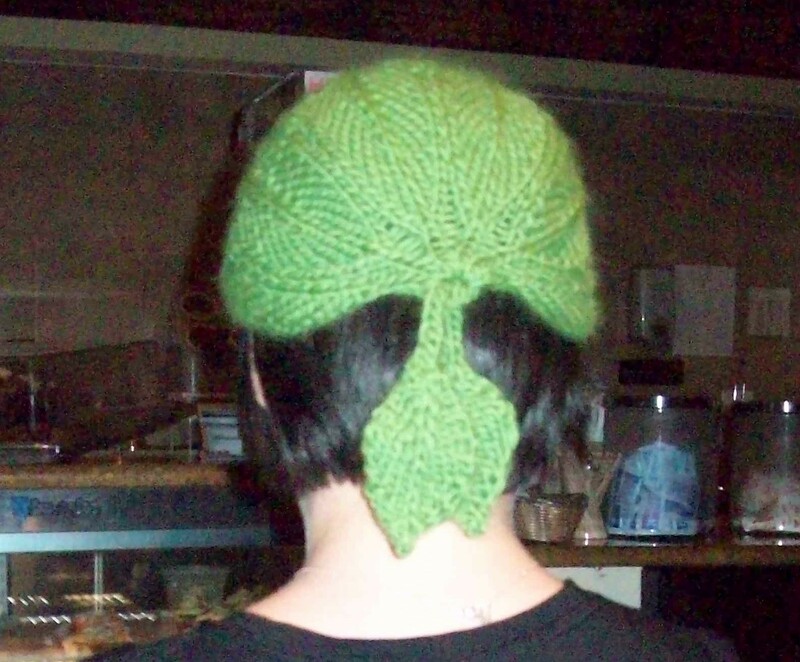 I have some great ideas for some sweaters.. but really? Do I need more sweaters when I don't wear the ones I have already? But—the bulky green wool I have would be perfect in one design, and I have an idea for a bright multi color yoked sweater, stripes and slip stitches, easy peasy color work. And I have this silk (150 gm of lace weight hand painted silk)—it will make a beautiful scarf --Another scarf? WHOA! Why would I need another scarf?) 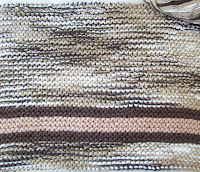 I've swatched a few stitch patterns.. but I don't like any of them, and this knitting will be frogged. I have a woven silk scarf from when I was 18—I still love it, and wear it (once every few years) and I have enough Other silk scarves to open a boutique—How can I think of knitting another scarf? But what else can I do with this silk? It's not enough for a garment, I only have the 1 skein--(its a big skein!) but not big enough for a small top. But IT IS BEAUTIFUL! I am beginning to understand now it was still in someone else's stash! 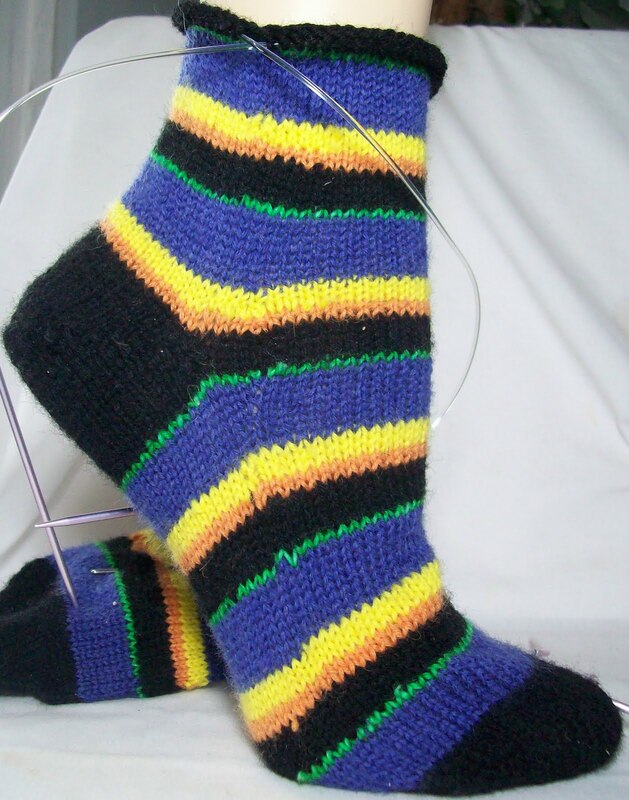 The knitting is completed—on the body of the sock. There are still a set of tails to weave in, (boring) and then there are the candy corns! The first niblet? I knit in the round. Way too tedious! Second one? I modified (these candy corns are still totally Anne's idea) I just have a problem following directions! 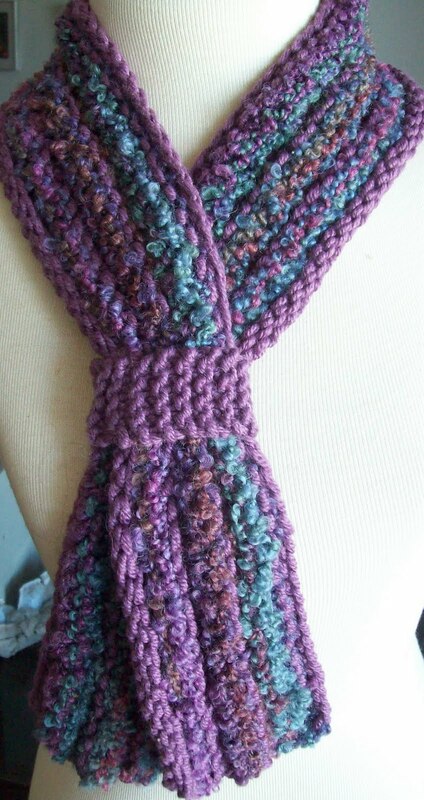 So I knit I-cord style—I cast on 13, not 14. I worked the yellow in the round I cord style, (and had a huge ladder in back. 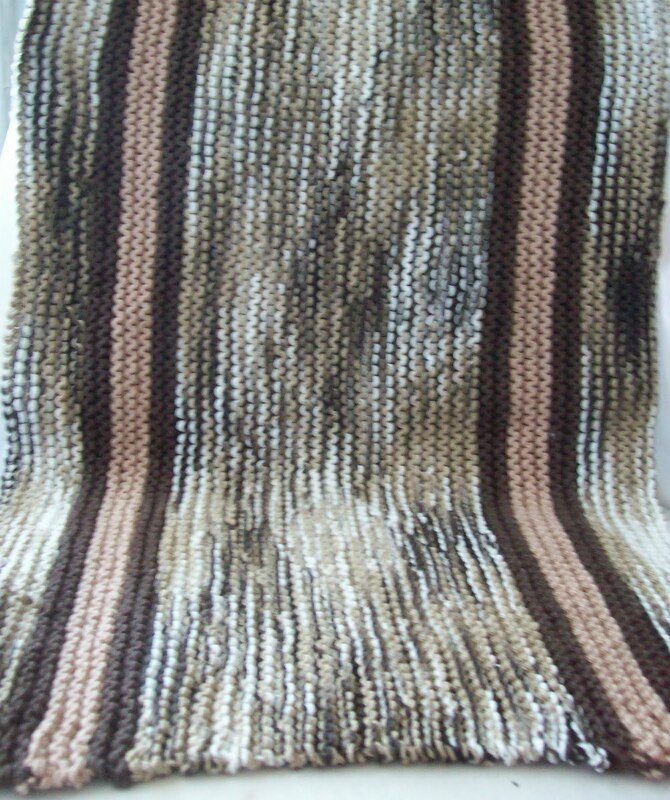 At the end of the last row of yellow, (actually it was at the FIRST row of orange, I stopped, turned the work, and with a small crochet hook, make a loopwith cast on tail, then chained up the ladder, and put the 14th stitch on the needle. 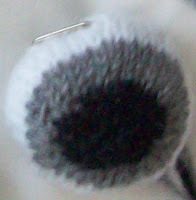 It was immediately worked in a K2tog with the penultimate stitch, and my stitch count was 10. At that point, I stopped. Latter this afternoon, while the sun is still high in the sky, I'll go back to work making candy corns. 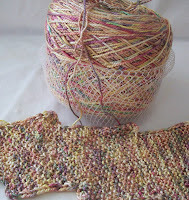 And then I'll finish the sock (weave in all the ends) and add the candy corns! at this point I think I will need 16 (8 corns per sock) but we'll see--If I get into a rhythm, maybe I'll make more! I am sure they will improve with practice. And soon I'll have a serving or two to sew on my socks! Have you seen JUPITER? Why not!? This month show won't be as spectacular as last months, but once again, the waxing (but not yet full moon will be Jupiter's companion—Tuesday they will be closest (or rather appear to be closest) but any evening this week, at 8:30PM or so, they will be companions in the sky. The weather forecast has rain (and that mean CLOUDS!) here in the NYC area(on Tuesday) —but the effect can be seen up and down the east coast of North America, with the best viewing, from about Philidelphia to Boston—Tonight to Wednesday. Look up, find the moon, and find Jupiter—It is so very bright, is it super shiny and bright even in the light saturerated skys of NYC (where only a half dozen or so stars are bright enough to be seen) If you think you see a headlight from a plane—close to the newly risen moon, then that's it! It is that bright! And all the new ends woven in—Well that was true last night. Since then, a green stripe and a black one, and more ends to weave in have been created. As I get closer and closer to the cuff and having the body of the sock knit, I become more and more obsessive about weaving in the tails. If I left them all till the end, I know—I would just never would get them all woven in! I am so looking forward to knitting the candy corn. I might very well change my mind about how much fun they are after a half dozen or so, but for now, I can hardly wait! I think my stripes are good ones for a Halloween theme, but that the sock will benefit from more yellow and orange-the candy corn will be just the detail to make them perfect. Should I knit some mini pumpkins too? These I would embroider and make into Jack lanterns. Would a pumpkin be too much? To big? --They would most certainly be out of scale with the candy corn! Well I can always plan another pair of Halloween socks for next year and put pumpkins on them! Monica gifted me some Knit Pick sock yarn in Pumpkin color--and I have more Orange (a brighter orange than the pumpkin) Kroy yarn. So Pumpkins are a possibility! Here in NYC we are having a wind storm--(a Nor'easter) but the leaves are still green for them most part. I know, just a few mile north –Rhinebeck, say--(I am not going to Rhinebeck) many of the Maples are in full glory. But here in the city, the days are cool, the nights cooler, and the trees are still mostly green. But I have already worn my MAST socks, with the dangling little acorn! Demanded to know: Why did it have to wait, when clearly, the pile of UFO where not being worked on, but all sorts of other yarn was, and it wasn't! So yesterday, Sunday knitting at Panera's was the occasion for casting on halloween socks. I still haven't perfected the candy corn motif I want to add and besides, the idea has been enlarged, and moved. It will be a sort of clock on the side of the leg, not a band on near the cuff. There might be some knit 3D candy corns to dangle from the cuff, too. (I took a cyber trip to MochiMochi Land, and was inspired!) Mine won't have eyes.. but aren't they adorable? 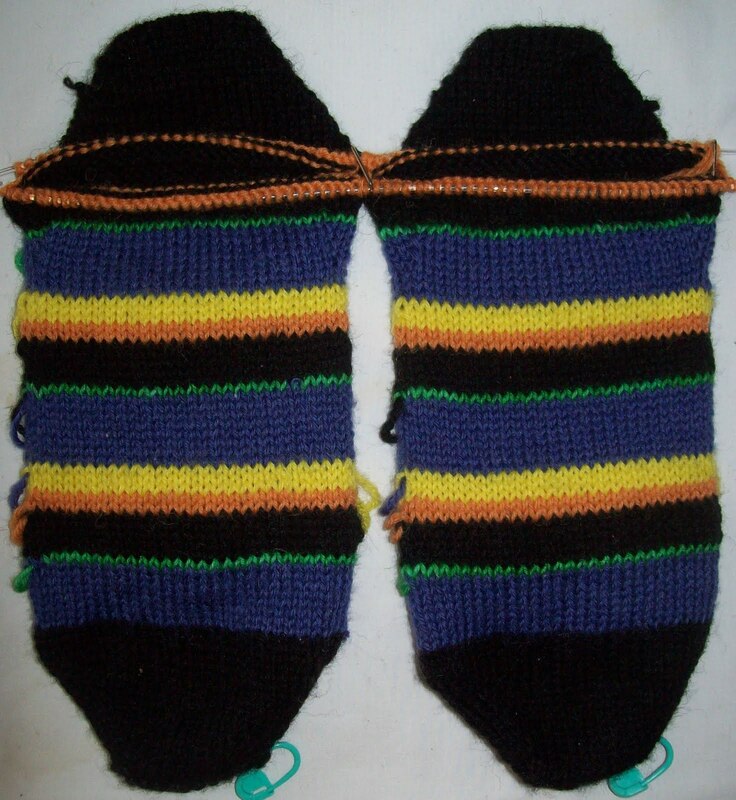 This is a pair of toe up socks (the last few socks it seems have been cuff down, and it was time for a change) –with mixed (Fibonacci's numbered rows) stripes; 8 purple, 1 green, 5 black, 2 orange, and 3 yellow. Each set of stripes-- (19 R's)-- is more or less (than) equal to 2 inches. A black toe, (and heel and cuff) and stripes for the foot and leg. Mixed stripes mean lots of ends to weave in—but that's OK—Weaving in is an excuse used by lots of knitters for avoiding stripes. 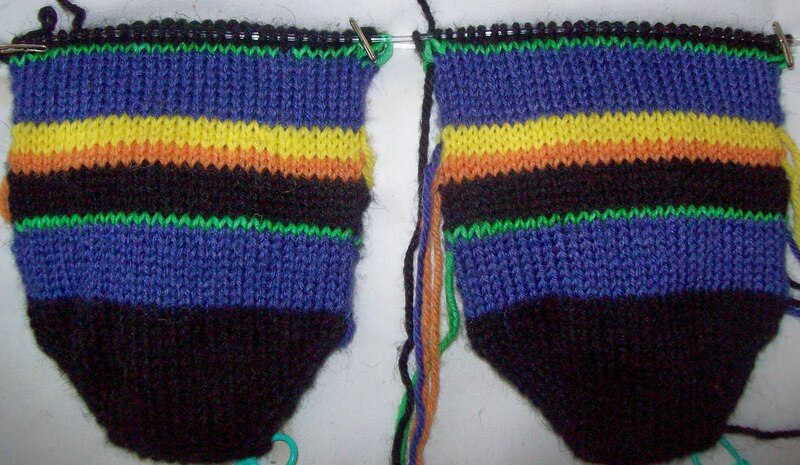 I am (self evident if you look at my sock collection) a fan of self striping/self patterning yarns--but sometimes, the only way to get the desired effect is to stripe the socks yourself. 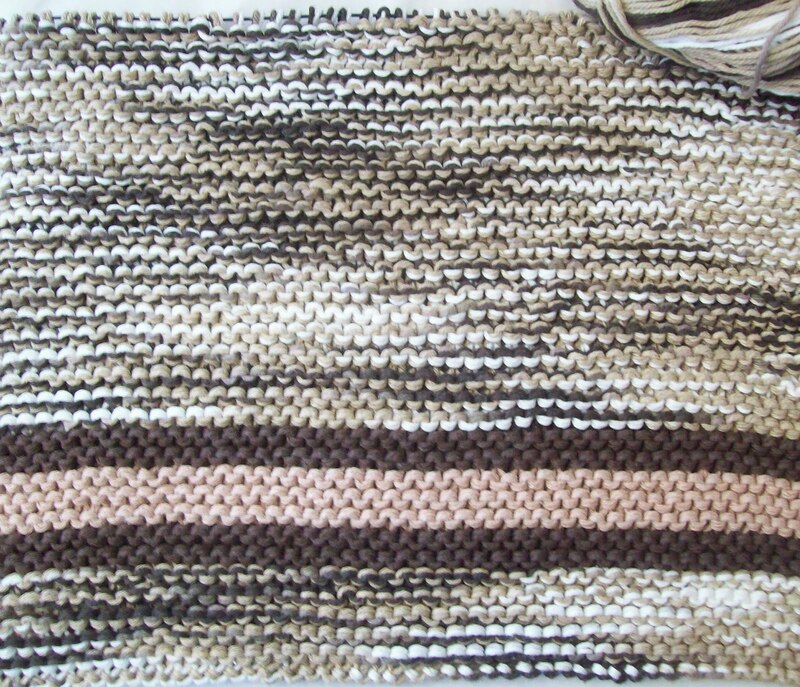 I've done regular stripes, mix stripes and spiral/helix stripes. Stripes offer a lot of options! I don't obsess about the jog that occurs when striping—I make a small effort to minimize it.. but for the most part, I live with it. You'll have to wait till some of the tails are woven in to see the change in jogs. Half the stripes start on the right, half the stripes start on the left..there is less of jog, because of this. It also make it easier to weave in the tails—since I won't end up with a bunch of tails on one side (and none on the other)--with short rows of stripes (1,2, or 3 rows) —it makes a big difference! I've tucked the tails in on the left sock—because I think they are distracting—and the sock looks better with them tucked in, but left them out on the right side to show as an explaination. Oh—Yeah it's one of those weeks! I work on the Sunday NYTimes crossword puzzle every week—and every 9 to 10 weeks—I complete it! Tthis week is one of those half dozen times or so every year that I solve it (every cross!) 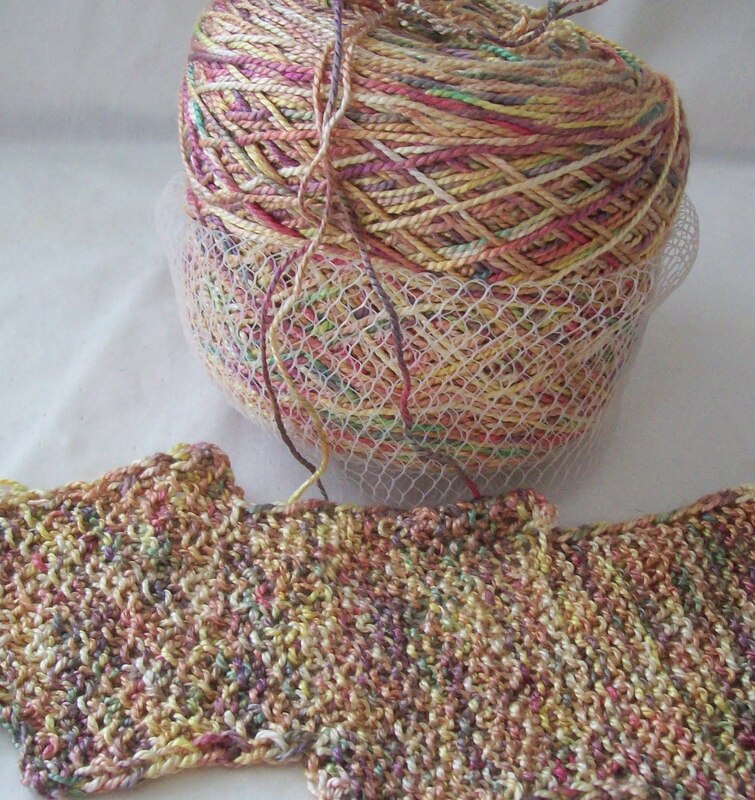 --I didn't start till last night, after dinner, (after knitting!) and I had it done before bedtime! That's what we are having—and its a good thing! This summer was long, hot and dry. NYC depends on its reservoirs for water, and they were, just after labor day, 12% down. But we had rain last week, and again this week, (yesterday, again today, and more still predicted for tomorrow—and by yesterday afternoon we were 2% above capacity. 8 million people get up and shower and make other daily absolutions, and our daytime population is 15 million--just the coffee and tea consumption of 15 million people—not to mention what happens to the liquid a few hours later—is 15 to 30 million gallons of water a day) So 1 or 2% of the reservoirs is a whole lot of water—especially when it comes in the form of rain! Sunday, I finished these socks—but I managed to leave them in the car—and yesterday, I THOUGHT of getting them, but it was raining—REALLY RAINING—and I said to my self, forget it! Today in a break—I went to garage and got them--and got them photographed. 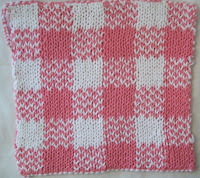 Saturday, I posted yet another version of my classic gingham potholder—done in double knit. 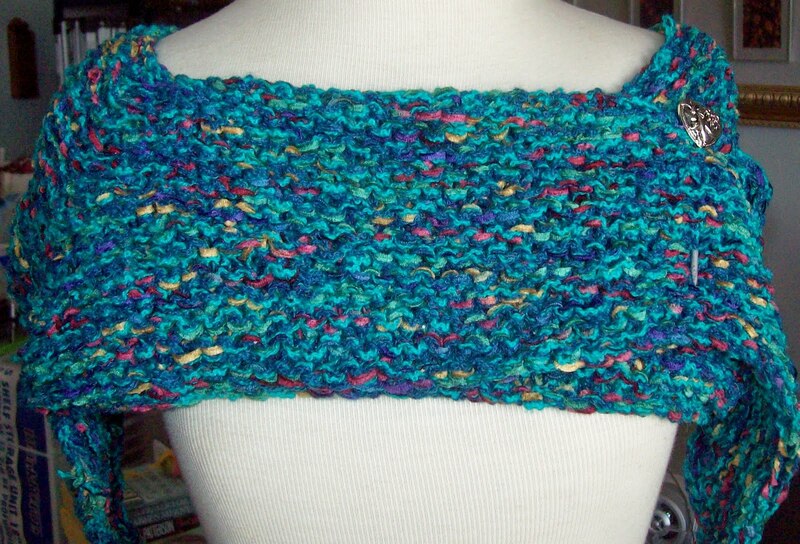 Today, there is a link (see left hand column) for Free PDF download of the pattern for this potholder. The pattern is free—for you to download and use for personal use(or for gifts). If you want to use it for sale or fund raising, or use the pattern to teach double knitting, please contact me (my email is in the footnote) for permission--it will still be free--I just like to keep track! 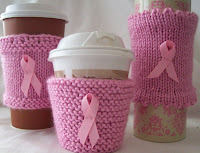 Tomorrow I hope to have finished the patterns for these 3 (and a few more) cup cozies. This pattern is also free, and can be used for Breast Cancer Awareness and other non-profit Breast Cancer fund raising projects. They are very simple--and will be used (by me) for teaching as well. If you want to use them for teaching, again, contact me for permission. Yesterday I swatched a candy corn pattern (for shape) and I am not sure yet about how I like the look of the swatches... In other words, the same old project desire overload!